Some of my favourite type of Cydia tweaks are the ones that don’t necessarily change how iOS works, but reimagines and enhances what Apple has already created. Such is the case with the new tweak Bragi. Bragi has taken the music controls in Control Center to the next level, redesigning the look of the controls and adding album art. Bragi not only adds album art to the player, it also adds vibrancy to the labels, giving the player a bit of colour. Tapping the album artwork will open the Music app. 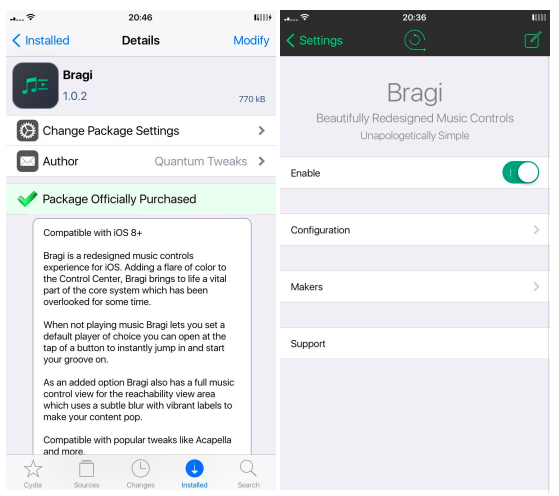 All you regular controls are there, including sharing and favouriting .Bragi also adds the player to the Reachability view, giving you yet another option to control your music. One of the coolest features of Bragi is it allows you to change your default music player. The music player is usually set to the stock music player, by default, but if you’ve installed any other music players from Cydia, you now have the option to use those as the default player. Bragi integrates perfectly with iOS. I installed it on my iPhone 6, on iOS 8.4, and I have experienced no issues, at all. There is no lag when bringing up Control Center or invoking Reachability. The controls in Bragi are clear and simple to use, looking like they were meant to be there. I also have CCSettings installed, and there seems to be no compatibility issues. Overall, I would recommend this new tweak. Bragi is available in Cydia now, in the BigBoss repo, for just $1.00. If you check it out, comment below letting us know how you like it.